The art of sausage making began as a traditional food conservation and preservation technique thousands of years ago. In the butchering process there were always leftover pieces or scraps. To avoid the waste of throwing these scraps away or having to feed them to animals, one industrious butcher took the scraps, ground them into a mixture, cooked them and decided he liked the taste. He improved the mixture more by adding some fat and spices. Later on, the ground meat was stuffed into casings made from intestines. These cased ground meats became sausages. They could be cooked and eaten or preserved for later consumption by smoking. 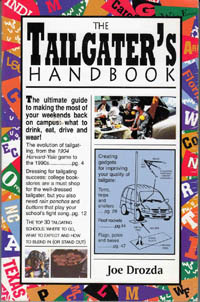 Today’s tailgaters favor sausages because of their availability, great taste and the ease of preparation. Modern USDA inspected sausages are made from good cuts of meat and have been tested and improved so that the resultant product is as good as possible. America's most popular sausages are made by Johnsonville and come in different flavor options. They can be Bratwurst, Italian, Hot, Mild or Sweet and even more types. Years ago I received a cooking lesson for fresh non smoked sausages from David Finch, then head of marketing for Johnsonville. He said, “Probably the important thing for bratwurst and other tailgate sausages is to keep them juicy.” He inferred that it was just like having a steak. We like it juicy and we should want our bratwurst to be the same. Remember this rule. Never touch your sausage casing with metal or other kind of utensil that will break the skin. Finch said, “Handle them with kid gloves. That's right, wear gloves. Get some white plain work gloves that can be thrown into the washing machine after use. Then keep a pot of cold water handy. Dip your gloved hand into the water and get it wet, then use this hand to place the uncooked brats on your grill. Dip this gloved hand into the cold water frequently to keep it cool as you turn the sausages. Use the dripping water to cool your coals when necessary.” From my experience, if you use Finch’s cooking technique, your end product will be the juiciest sausage sandwich your friends will have ever eaten. They will definitely need a napkin, or a bib. The night before it is wise to simmer your sausages in a large pot of half beer and half water for 20 minutes. This way you know they are cooked properly. You still need to remember to handle them with gloves. Then on game day you only have to brown them on the grill. Raw sausage, otherwise, must be cooked very slowly and reach a cooked temperature of 165 degrees.